On the 21st: Earlier this week, we hosted a conversation in front of a live audience at Riggs Brewery in Urbana. We focused on the issue of trauma — what it is, how it's affecting kids, and what all members of the community should do about it. Today, we're bringing you that conversation in a special hourlong broadcast. On today’s show, you’ll hear a special hour of a community event we recorded in Urbana earlier this week. We focused on one important issue that affects kids, families, and educators all over the state from every socioeconomic background: helping children deal with trauma. When we say trauma, we’re talking about everything from violence in their communities to problems at home. Or maybe even having a medical condition that causes trauma. Whatever the cause, children who experience trauma can experience long-lasting effects. And where does this play out? Well, for children — in school. Educators spend a lot of time with children. And students affected by trauma have those problems show up in the classroom. So we convened an audience of parents, teachers, activists - and children - to talk about how schools in Illinois are dealing with this. Lee Gaines has been reporting on how Illinois schools are stepping in to help these children. She reported on this for the Illinois Newsroom, a new statewide reporting project based at Illinois Public Media. We were also joined by Karen Simms, founder of Meridian K Consulting. She works with families, teachers and kids to better cope with trauma. Regina Crider is the director of the Youth Family Peer Support Alliance and advocates on behalf of youth and families affected by mental illness. She is also the Pastor at Crossroad of Life Community Church. And Elizabeth Degruy is the director of special education for Champaign Unit 4 Schools. 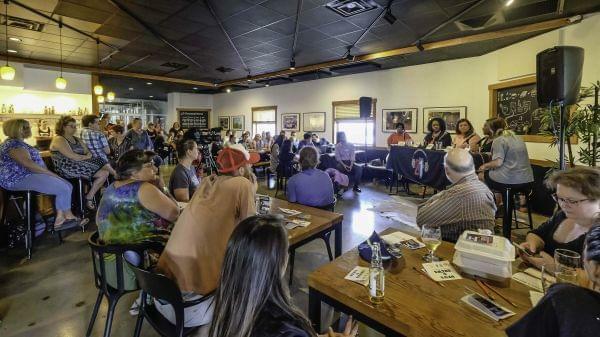 Niala spoke with Lee, Karen, Regina and Elizabeth in front of a live audience at Riggs Brewery in Urbana on Tuesday night.